Gregory A. McKay is a veteran of Law Enforcement with an emphasis on criminal investigations of violent crime. Prior to coming to Arizona in 1995, he attended Penn State University and was a police officer outside of Philadelphia. Gregory joined the Phoenix Police Department in 1995. While with Phoenix PD, he worked in the Patrol Division, the Organized Crime Bureau, the Street Gang Unit, the Crimes Against Children Unit, the Fugitive Apprehension Unit, and the Homicide Unit. He had a track record for successful investigations that led to lifelong incarcerations of major offenders. 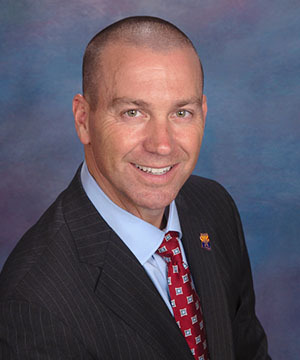 He was awarded Arizona's Investigator of the Year in 2012 for solving several unsolved child murder cases. As a former Arizona foster parent, he has intimate knowledge of the trauma of child abuse and the advocacy required to successfully navigate the permanency process. In 2012, he was appointed by Governor Janice K. Brewer to create the Office of Child Welfare Investigations to protect alleged victims of felony child abuse and sexual abuse. In 2013, he was awarded Childhelp USA’s Heart of an Angel Award recognizing his distinguished career in child advocacy, investigative expertise, and removal of child predators. In 2014, he was appointed to the independent Child Assessment Response Examination (CARE) Team formed by Governor Brewer to study and present a strategy for improving Arizona’s child welfare system. On February 10, 2015, he was appointed Director of the Department of Child Safety by Governor Douglas A. Ducey. Director McKay has led several breakthrough initiatives to improve the lives of children and families. Under his leadership, the department successfully completed the backlog of uninvestigated cases that had plagued the department for years. The department also safely reduced the number of children in state foster care by 10% in 2016, thus reversing a ten year growth trend of 92%. By eliminating hotline hold times, reducing staff caseloads, decreasing congregate care and increasing family and community engagement in the service of the state’s most vulnerable children, the state is poised to meet Director McKay’s goal of making Arizona the safest place in the country for children to grow and thrive. Arizona will become the safest place in the country for children to grow and thrive. As the Director of the Department of Child Safety, that is my goal. There has never been a more exciting time to capitalize on the reservoir of goodwill of those who are anxiously awaiting an opportunity to serve those who are truly in need. DCS is proud to work with all Arizonans to navigate a course of shared accountability and engagement that includes government, public and private partners. The opportunities are endless, as the hearts and minds of deeply caring and innovative people will help drive this dream into reality. Arizonans are all-too-familiar with this endeavor falling into confusion, ineffectiveness and a shortage of hope. But I commit to everyone that we are in a time of effective engagement in which lives will be enriched by our efforts to help the most vulnerable among us. DCS is a forward-looking agency. We will remain alert to current challenges without forsaking optimism for a brighter future. This agency is marked by industriousness, enthusiasm and a passion to serve children and families in a way that overpowers those who do children harm. Our confidence, competence, integrity, and team spirit will influence skeptics to choose to be part of creative solutions that empower all. Success is the peace of mind knowing we did the best of which we are capable of every day. Our purpose is fulfilled when we leave people better than the way we found them. From the smallest to the largest of tasks, DCS will ensure we are always at our best, because our best is always needed. Children, families and our entire community deserve nothing less.